How I Gained It: I was a chubby kid. My parents panicked and put me on a diet at age 9. They were concerned and well-meaning, but the 70s were the dark ages. Dieting wrecked psyche and metabolism. I was either making an attempt to live under the depressing conditions of the latest diet, or binge-eating as if it were my last day on earth. 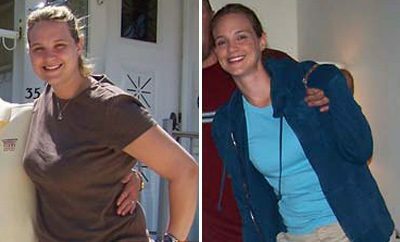 I lost 100 pounds twice in my 20s but regained it, in large part because I made the change out of shame and because I believed that my pre-existing problems would magically melt away with the weight. Even at a smaller size I was still the ashamed fat kid who was never good enough. By the time I hit my 30s I was 300 pounds and utterly worn out by the lose-gain cycle, so I waved the white flag of surrender and decided I would eat whatever I wanted when I wanted. My designated food groups were fat, white carbs and salt: French fries, potato chips, Italian bread soaked in butter, cheeseburgers and fried chicken. Cream cheese was my all-time favorite source of protein. No need for salmon or spinach, thank you very much. My mission was to seek out food that tasted good and helped me escape the feelings of turmoil over a stressful job, unhappy relationship and the deep sorrow over slowly losing my father to Alzheimer’s disease. Breaking Point: I was sitting in front of the TV the afternoon of January 5, 2009, working my way through a large bag of potato chips and a party-sized bowl of clam dip. I’d just come from my annual checkup at the doctor’s, where I learned my weight was at an all-time high of 345 pounds. Equally discouraged and disgusted, I retreated to the couch to watch Oprah reveal that she’d fallen off the wagon (boy, could I relate). Unbeknownst to me, Carnie Wilson was a guest that day, beamed in via sattelite to explain her recent turnaround and weight loss. I was riveted. Carnie was slender, her eyes glowed with contentment, and I had an immediate realization: If she could do it, there was hope for me. I’d always considered Carnie Wilson to be my genetic twin: we were both chubby kids who became fat teenagers who became obese adults. And we were both trapped by an overly zealous love of food. How I Lost It: Through a Google search, I found Carnie’s fitness guru, Diamond Dallas Page, and began doing his DDPYOGA workouts regularly. The routines began to strengthen my lethargic and sedentary body. They’re also a cardio workout and got my heart and lungs in better condition. I was given valuable nutritional mentoring from Dallas Page, who suggested I give up gluten and cow dairy. 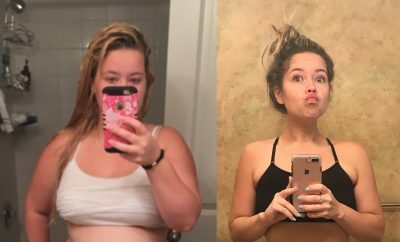 As much as I adore bread and cheese, I was willing to give it a try and amazed at how much better I felt — the weight also started coming off like never before. The last thing I wanted, however, was to be doing anything that felt like a diet, so I set about putting habits into place I could live with. No food was permanently off limits. But at the same time, I had to acknowledge that a steady stream of junk food was doing me no favors. I agreed to have treats like fried chicken when I was truly craving it, and not when I wanted to fill an emotional hole. The lighter I became, the more I wanted to do. Nine months into my new way of life and 100 pounds lighter, I trained for and participated in the Avon Walk for Breast Cancer. To this day, I love long-distance walking, as well as weight-training, Pilates and all forms of yoga. I wore nothing but black stretchy clothing for 20 years and now I wear color! It feels great to walk into a clothing store and gravitate to a rack because of the color or style, not the size of the clothing. That experience beats the daylights out of hoping to find something quasi-fashionable in a plus-sized clothing catalog. I also travel a lot more. Trying to fit into an airplane seat at 345 pounds is something I wouldn’t wish on an enemy. I no longer avoid crowded restaurants for fear of knocking tables askew with my hips, and don’t flee the building like it’s on fire if someone pulls out a camera. What’s different at the core is knowing I deserve to be happy. That was a belief that always eluded me. And no coincidence that once I turned that belief around, a happy and fulfilling relationship with a wonderful man was added to the list of positive changes. I’m very fortunate that the Carnie Wilson/Oprah incident was my wake-up call. It’s a mixed blessing that I come from healthy genetic stock. Even during the obese years, my blood pressure, cholesterol and blood sugar were all about average. I’m not saying they were great, but there was no solemn moment when my doctor warned me I was a ticking time bomb. Like I said, a double-edged sword. I could have gone on for another couple of decades at that size, but at what cost? My blood pressure may have been OK, but what good was that if my energy level was non-existent, my mobility severely limited and the majority of my mental energy harnessed in the direction of orchestrating my next binge? Today, I love food, possibly more than ever, because I eat with awareness and not in a trance. And I love other things, like climbing a few flights of stairs without sounding like a locomotive, wearing high heels instead of flat sandals, slipping into the back seat of a compact car and mentoring others who are on a similar path. So who knows, if you’re reading this and want similar things to unfold for you, maybe I can be your Carnie Wilson and let you know that it really is possible. Start out wherever you are and take the first few steps in a new direction. If you really want it to, your perfectly imperfect path can deliver you to a new life. After Weight: 160 pounds. To read more of my story, visit my blog, StaceyMorris.com. I took pics of the whole article with pics for motivation!!! Amazing. Congrats and thanks for the inspiration! I wondered how that series was and thought about giving it a try but didn’t want it to be another dust collecter. I do love strength training yoga so maybe this is yhe right combo for me. Stacey Morris is awesome and DDP Yoga is the best workout on the planet! I have tried EVERYTHING, my flexibility has increased so much, and my quality of life (example – being able to bend down and pick something up off the floor pain free) has improved tremendously!!! 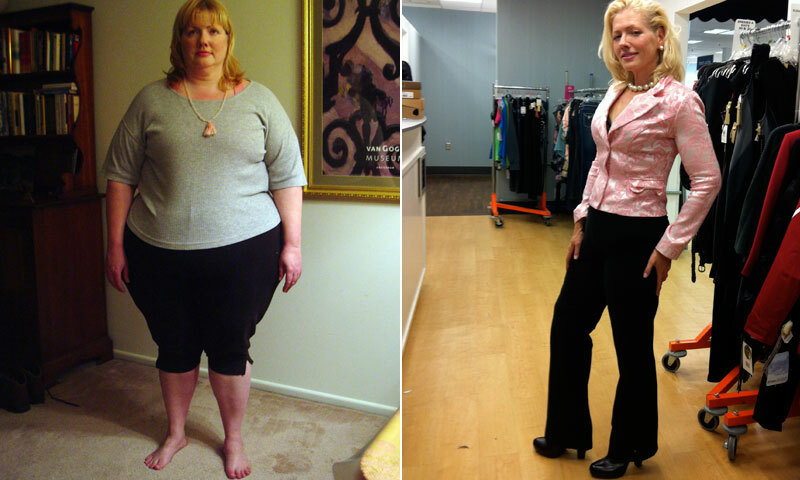 an inspiration…I just ordered DDPYoga! Can’t wait! Stacey Morris also has a fantastic blog; she is a brilliant and inspiring writer! Phenomenal! I am happy for you that is so awesome and inspiring. Fantastic! I love seeing pictures and reading success stories. Tremendously well done. I too was inspired by Carnie!!! Holy smokes!You are awesome! Amazing! Thank you so much! I too am near your starting weight and needed the aha moment here. I too ordered DDPYoga and have not started it, but you just gave me the inspiration to. Thank you! You are a gem! You look incredable, so inspiring. I thought Carnie Wilson had “Gastric Bypass” Surgery?! Not once but twice b/c she gained her weight back again~ Just not sure “what” inspired you about her since you did it on your own? Congrats for all the hard work.. You deserve it!! Excellent! Congrats u look amazing! 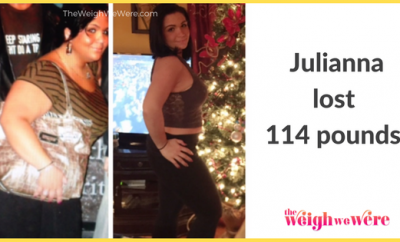 114 Pounds Lost: She didn’t believe she could, but she did! How I lost over 110+lbs!